Have you thought about the person, who has a great influence on you? 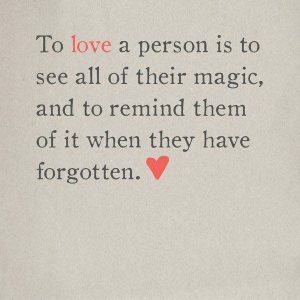 This person plays an important role in your life. You may think it`s your wife, husband, mother or father. Perhaps, you`ll be right if you don`t have a job. 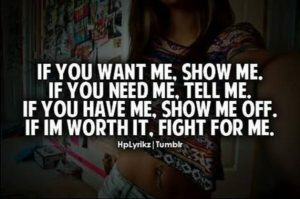 But if you have, it`s your boss, mentor or employer! Let`s think who has an impact on your mood? Who decides when you should go home and if you`re worthy of some holiday? Who gives you money? The answer is your supervisor! Whatever you do, your boss will always be the first person you ask for help or advice. 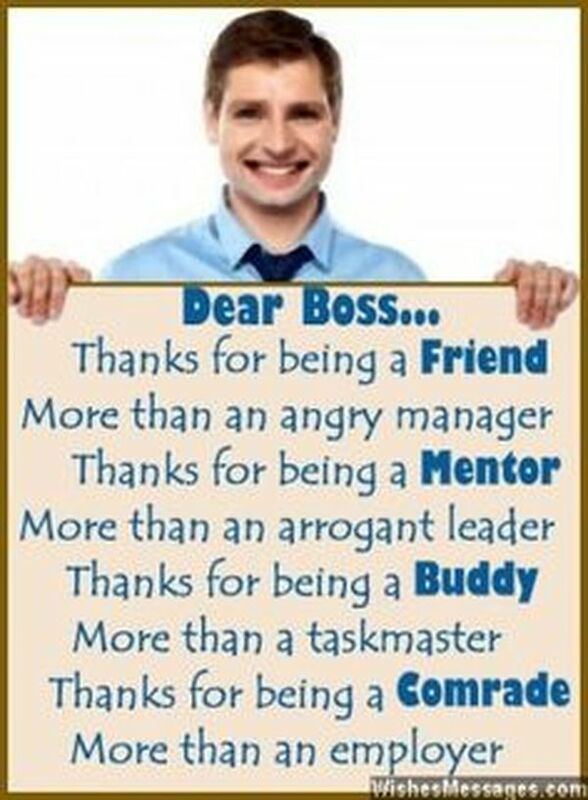 For these reasons, don`t miss any opportunity to say “thank you” to your boss not only when it`s a bosses day! 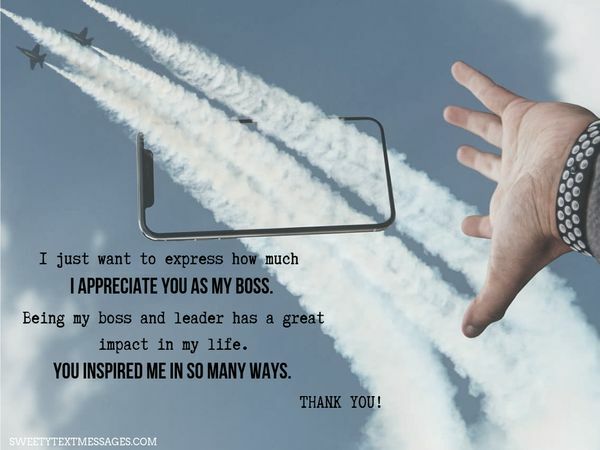 You have a lot of variants how to thank your boss: use an email, farewell messages, a thank you note or an appreciation letter, a thank you images or some quotes! 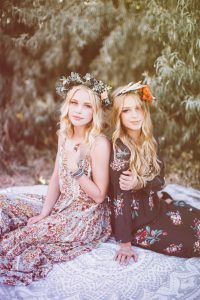 The reasons for being grateful are also numerous: you may thank for his or her guidance and support. It`s also possible to say “thank you for encouraging me and promotion”, “thank you for your leadership”, for the recognition or a bonus. And of course, don`t forget to pronounce “thank you for the opportunity to work with you” when you are leaving your job! Remember: it`s never too much to get along well with your boss! Whenever you want to thank somebody for something they have done for you, the words of gratitude should be genuine. We guess there’s no need to explain to you that fake thanks are seen miles away. Don’t be afraid to sound cheesy, because if your “thank you” is going from the depths of your heart, it will be appreciated. Can you recall your first day at work? Chances are you were super nervous and made a few mistakes. Yet there was a person whom you could rely on. Of course, we’re talking about your supervisor. So, don’t miss the chance to express how grateful you are for his/her encouragements. Your encouragements mean the world to me. Thank you for giving me the opportunity to learn from you. I want to remind you what a pleasure it is working for you these years. I appreciate your support and management style and feel I`ve learned a great deal here. 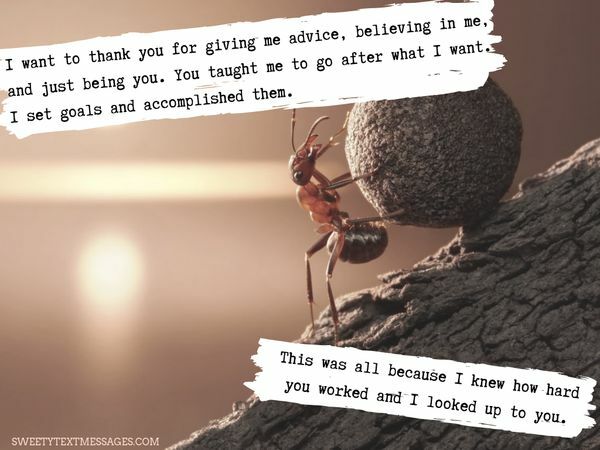 I want to express my deepest gratitude for believing in me. You have been an excellent friend, teacher, mentor and a great inspiration for me. You have inspired me to pursue my goals with hard work and dedication. You have shown me the value of honesty, sincerity, and trust in business. 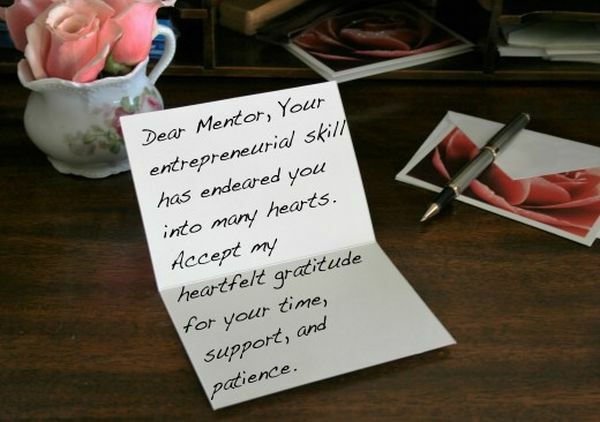 Do you feel like writing an appreciation letter to your boss to thank for everything he or she did for you? But it always seems that there aren’t enough words to show your thankfulness, right? Don’t panic, because you’ve got some great samples of what to write in a thank you letter. Since the day I started to work with you; I know I’ve changed a lot that really helped me to become a better person inside and out. You are one of the reasons why I’m always trying my best. Thank you, my boss. You know I appreciate you in so many ways. I am so grateful that you took me under your wing when I first started at this company. Your leadership and example have helped me grow into my potential. I would not be where I am today without you. This letter is to express my appreciation for all of the hard work, long hours and late nights you put in to make your business a success, in an effort to prevent layoffs and retain your employees. I’d like you to know that none of this has gone unnoticed by the workers, and we are grateful for your kindness, loyalty, and commitment to all of us. Supposed you have already come up with a few words and phrases to use in your appreciation letter to the employer, is there a chance that those are enough? 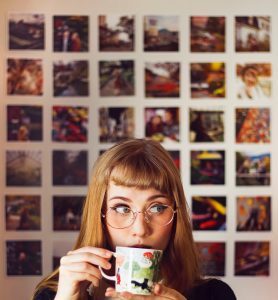 Check out some ideas below and, who knows, maybe you’ll find something worthy to add to the existing list. Your consistent guidance helps me to increase my potential at work. You show me the path of the bright world, which makes me able to grasp this opportunity in my career. Thankful to you, boss! Thank you for teaching me that every mistake is just a learning experience. I have learned so much from you. Ever since I have been working for you, I found myself evolving both with respect to my career as well as a person. I cannot thank you enough for your mentorship over the years. You have been such an integral part of my career. I hope to inspire others as you have inspired me. The leadership qualities can’t be underestimated. Even if being a leader and tutor seems like a quite easy task, it’s definitely not. That’s why it is so important to let your boss know that you value him/her as a leader of your team. 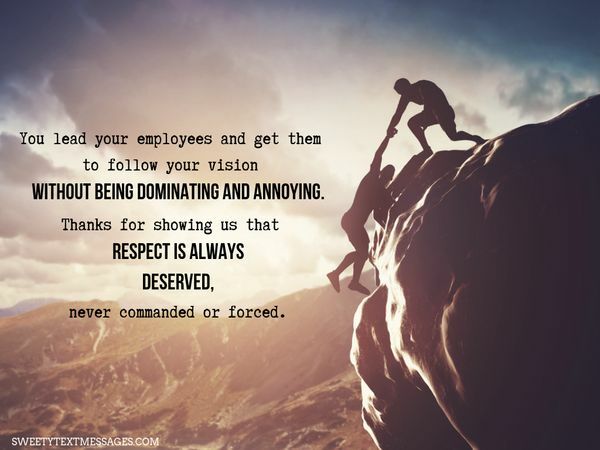 You lead your employees and get them to follow your vision without being dominating and annoying. Thanks for showing us that respect is always deserved, never commanded or forced. Your leadership skills have made our team possible. As a leader, you easily manage a team with a diverse background. I am so thankful that I was able to learn these qualities and skills from you. Thank you for all of your personal and professional guidance! Maybe you haven’t given it much thought, but any job offers a lot of opportunities. The point is, not all people can notice and use them. 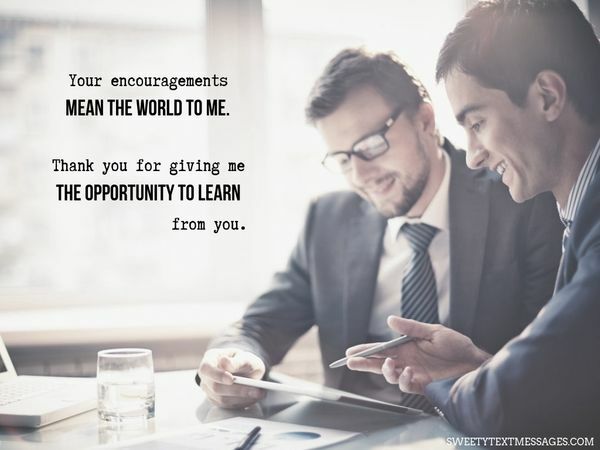 If you think that your boss deserves a special attention because his knowledge and skills have given you a lot of opportunities for growth at work, here are some interesting ideas of thank you notes. Thank you for the opportunity to work for and learn from you. I want to take a moment to let you know that I’ve learned so much from you. You may not realize this, but I am watching and learning from everything you do. Your organizational skills, professionalism, and kindness create an office environment that is enjoyable to work in. Thank you so much for extending compassion and flexibility whenever one of us needs a day or two off to care for a sick child at home. I appreciate having the opportunity to work here. 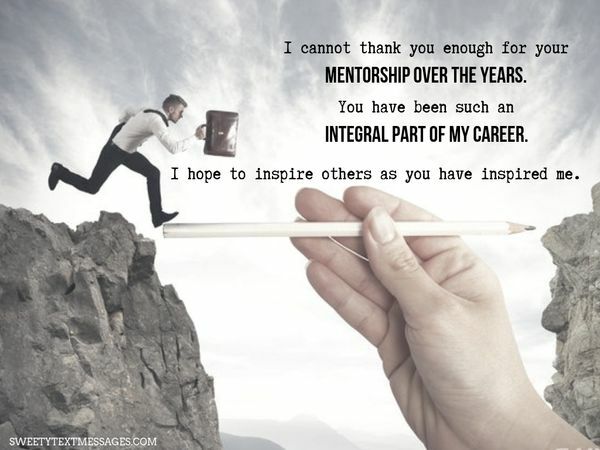 Thank you for your invaluable mentoring these past three months. I’ve had fun getting to know you better, and I’ve learned so much from talking with you and seeing how you work. You are amazing at what you do! I’m grateful to have had the chance to work with you so closely. 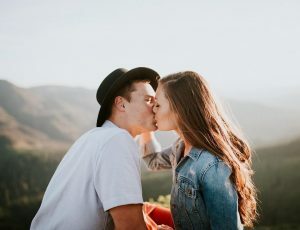 Who doesn’t like feeling support, especially at work? Knowing that there’s someone ready to lend you a helping hand when times are tough makes you ready to face any challenges. 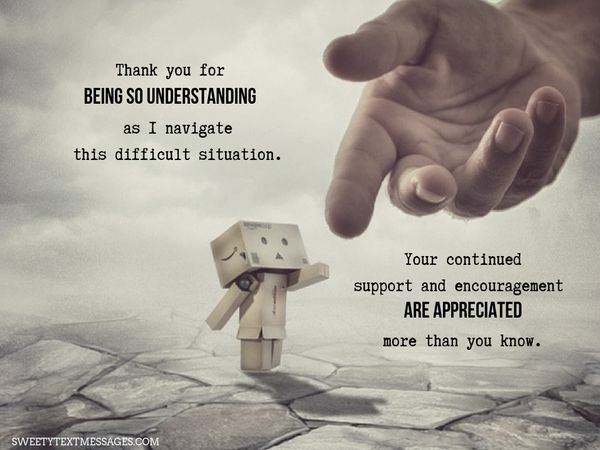 Thank you for being so understanding as I navigate this difficult situation. Your continued support and encouragement are appreciated more than you know. I am writing today to thank you for all the support that you have extended to me during my time here. From the time I started this job you have been nothing but helpful and supportive and it means more to me than you’ll ever know. Your guidance and support have shaped my professional life and today I can see the fruits of working with you. Accept my appreciation, sir! Thank you for your kind words. I am really grateful for your encouragement, guidance, and support. Your appreciation means a lot to me. Rest assured that I will continue to do my best at work and to support our team. Thanks. 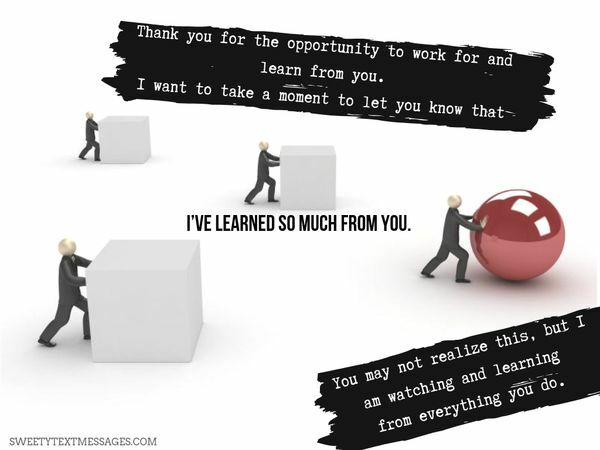 ng your boss taught you before you quit, the examples of beautiful farewell messages to the boss are exactly what you need. I would like to sincerely thank you for your appreciation. I hope to keep up my performance and wish that you will remain confident in me for future projects. 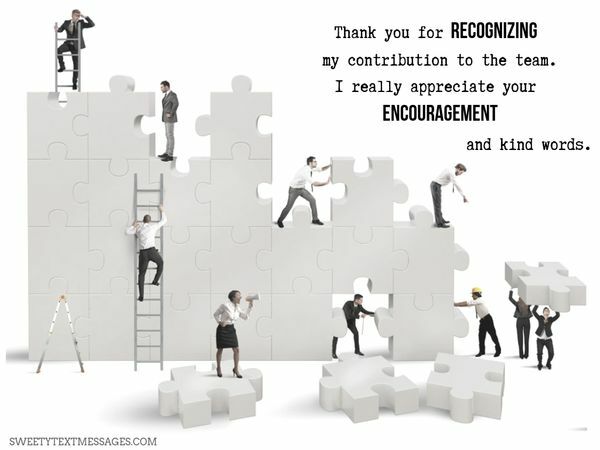 Your appreciation gives me great encouragement to do better. Dear boss! I would like to thank you for all that you have done for me. 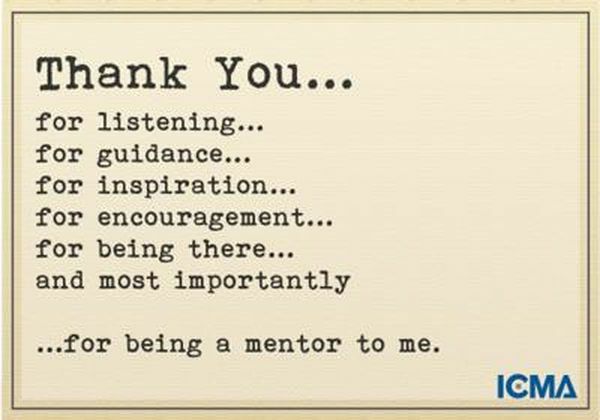 You are an amazing person and a great mentor. Your support has helped me accomplish a lot of goals in life. 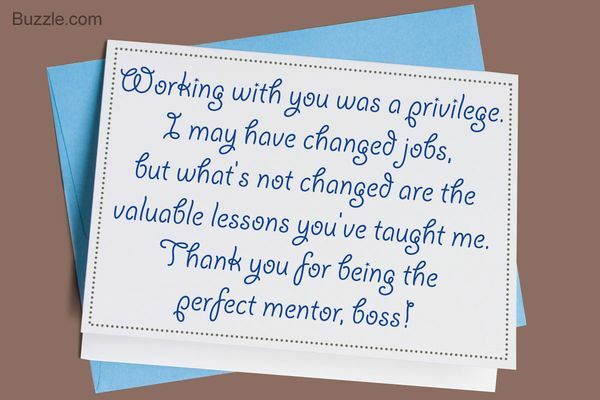 Whether you have been promoted or received a bonus, don’t forget to thank your boss for this. Thank you for the recent bonus. It is sure to come in handy, but more than that, it gives me great confidence to know that my hard work is being recognized. I’m so grateful to work for a company that shows its appreciation so generously. 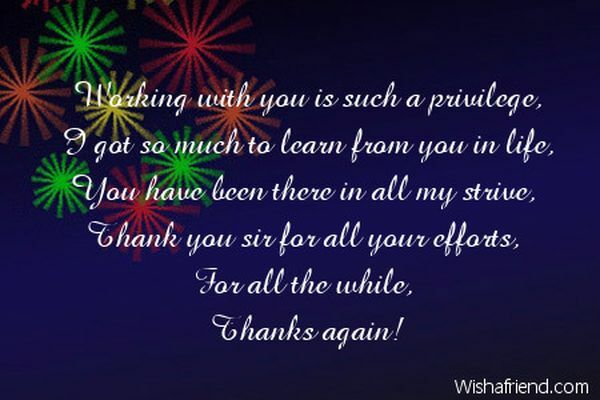 I’ve enjoyed working with you this year and have learned a lot from you. Thank you for the raise. I really appreciate it. Getting a bonus was awesome too! 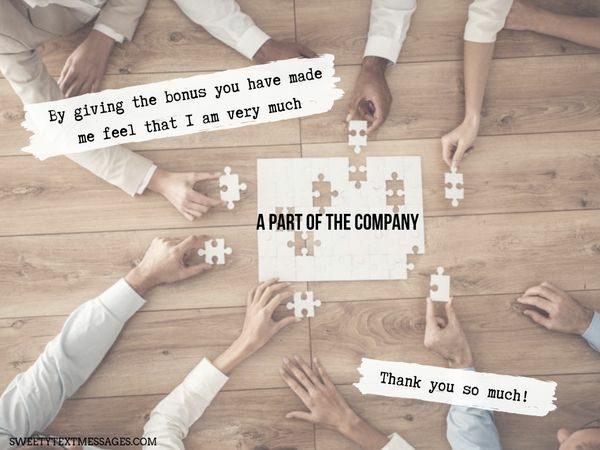 By giving the bonus you have made me feel that I am very much a part of the company. Thank you so much. Of course, when you leave your job, there are some mixed feelings. On the one hand, it’s nice to start something new, it’s always exciting. On the other hand, it’s sad to leave a place which holds a special place in your heart. One way or another, you need to show good manners and write a short thank you note to your boss to let him/her know that you appreciate the chance to have worked with them. I really appreciate how you have always been so friendly and supportive of all of my efforts even when they are slightly misguided. Working for you has been very enjoyable and I have learned and grown a lot. Thank you! 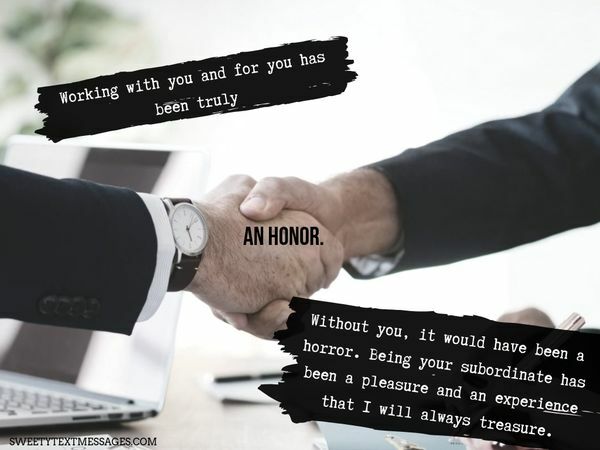 Working with you and for you has been truly an honor. Without you, it would have been a horror. Being your subordinate has been a pleasure and an experience that I will always treasure. 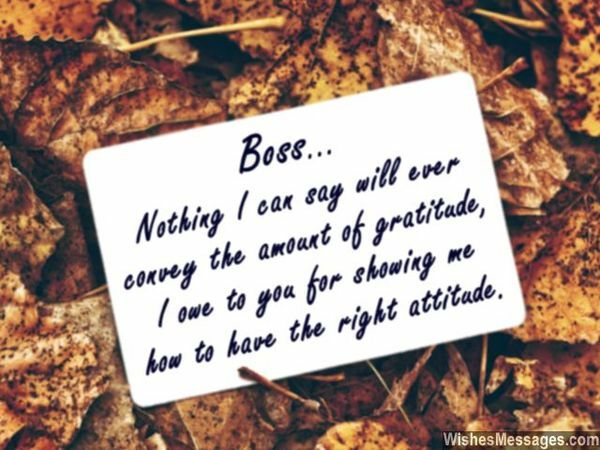 Thank you, Boss, for all the help and efforts you have made for me while I have worked for the company. Your assistance will help me to brighten my skills in my future job. Let us ask you a question. Why do you work in a first place? Most answers would probably be – to make money for a living. Nevertheless, people strive to be recognized for the work they did as well. 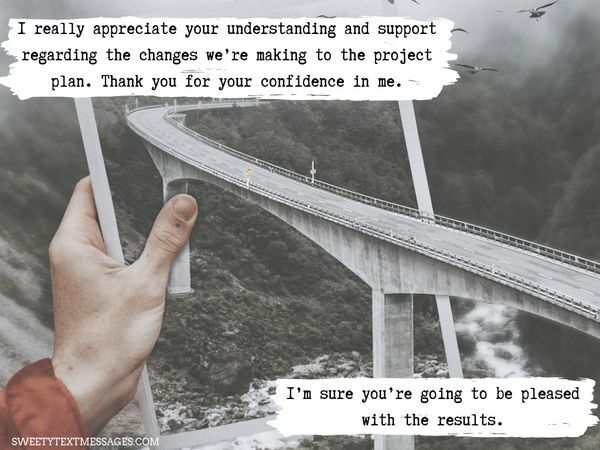 So if your boss has noticed your potential and recognized your contribution to the project, make sure he knows how thankful you are for this. Thank you, boss, for recognizing my efforts and presenting my laurels as a part of it. I am much happier to have such an understanding and supportive leader like you. Thank you for recognizing my contribution to the team. I really appreciate your encouragement and kind words. Thank you for recognizing my hard work. I’m glad the project was a success and I enjoyed being part of it. Each workday becomes survivable because of your praises. Thank you for recognizing my potential as an employee. It’s always nice to have a few thanking notes just in case. You are an amazing boss. Thank you for your guidance and training this year. It’s exciting that our team was ranked the highest in the company! I am motivated to do all I can do next year! It is one thing to be a boss, another thing to be a mentor, but a completely different thing to be a leader. We are proud to be led by a boss, mentor, and manager like you. Thanks for everything. It’s great that a stereotype about bosses being only strict and dissatisfied with employees’ work is in the past. Nowadays, a boss is seen as a mentor in a first place. If you start working in a new position, the help you get from your boss is priceless. 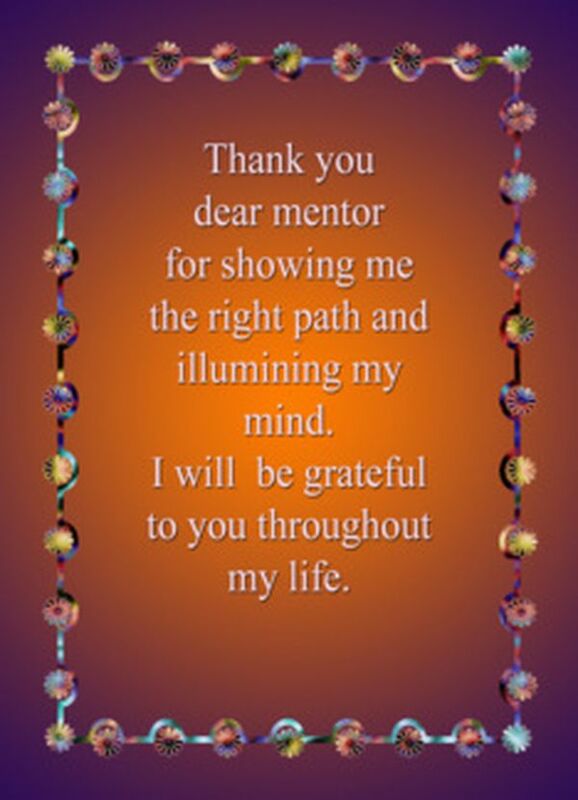 Below you’ll find beautiful cards which will express your gratitude to your mentor.